Gerdau Corsa is a leading manufacturer of structural and commercial steel profiles with a deeply rooted commitment to employee safety and protecting the environment. They actively demonstrate this commitment by seeking to implement safe, sustainable solutions throughout their production chain. Gerdau Corsa operates two steel and rolling mills, one in the State of Mexico and the other in Sahagún City, Hidalgo. The construction of the Sahagún City plant began in 2012, with the intent of developing a benchmark facility for the steel industry in Mexico and Latin America. With its $600 million USD investment, it is the single most important private investment in the history of the state of Hidalgo. The Sahagún City plant has 250 employees who maintain the machinery and work in high and medium voltage electric rooms. Safeguarding their lives, while they continue to work in areas containing electrical equipment central to the plant’s operation, represented a significant challenge when selecting a fire suppression system. Additionally, the fire system had to be aligned with Gerdau Corsa’s environmental protection philosophy. The new plant features integrated state-of-the-art sustainable technology which includes a preheating system and a continuous scrap-iron feed, as well as a water treatment plant. Executing on this vision required the implementation of a green and sustainable fire suppression solution to safeguard employees and protect the equipment. During the assessment process for fire suppression systems, the company discarded solutions that released inert gases such as CO2, because these systems pose considerable health hazards to workers’ during a discharge. Also, their installation called for modifications to the plant to maintain room integrity, which translated into increased cost and time to construction. Furthermore, in the event of activation, these types of gaseous fire suppression systems require the evacuation and isolation of the affected area before workers can go back into the facilities, thus delaying the time required to resume plant operations. Lastly, these types of systems cannot be zoned, so their installation requires an individual system be installed in each of the 33 areas needing protection. 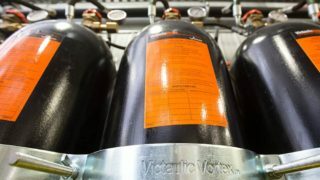 When Pronamet, a Mexican Engineering firm specializing in the design and implementation of fire suppression systems, became aware of the difficulties facing Gerdau Corsa, they knew, as a certified Victualic Vortex™ integrator since 2009, that a hybrid (dual agent) fire suppression system would be the best approach. “Pronamet worked hand in hand with Gerdau Corsa project engineers Gustavo Y. Martínez and Andrés Armendariz through the specification and installation phases of the project, to show that a hybrid fire suppression system can protect workers, electrical equipment, and the environment,” said Pronamet commercial manager Mónica Sánchez. 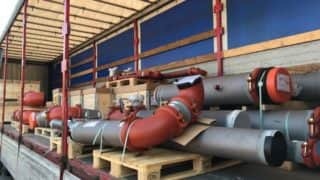 When discharged, the Victaulic Vortex 1500 Systems generate a fine suspended mist consisting of an inert gas (nitrogen) and fine water droplets with diameters of less than 10 microns by discharging both fluid streams through the same emitter. (See infographic below) The suspended mist attacks the fire by simultaneously reducing the temperature and oxygen levels in the protected space while still being safe for occupants. The system also allows for an immediate discharge when a fire is detected since the discharge is non-toxic and can be sized to operate in open spaces or rooms that are not hermetically sealed, eliminating the need for additional investment or modification of the protected space. The Victaulic Vortex works with elements present in abundance in the atmosphere, avoiding the use of toxic and expensive chemicals. As a result, this system is completely environmentally friendly and in-line with Gerdau Corsa’s original design goal. Lastly, Victaulic Vortex installations can be zoned, which conforms to the second design requirement for the project. A Pronamet study determined that Gerdau Corsa would save one million USD thanks to zoning. Additional savings were also obtained by eliminating the need to make construction modifications to the different areas for operating other fire protection systems. 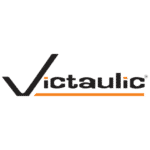 The Victaulic Vortex certainly offered a solution for each design challenge presented, however, this solution faced a major obstacle, the paradigm of using water to suppress fires in electrical rooms. Pronamet put the system to task by running several tests to prove the system’s effectiveness. Additionally the Victaulic team worked closely with Pronamet to help assuage any additional concerns that Gerdau’s engineering staff presented. As a result of the combined efforts from the Pronamet and Victaulic teams, the Gerdau Corsa engineers accepted the Victaulic Vortex for use on their project. The Pronamet team installed a total of ten Victaulic Vortex 1500 systems to protect electrical rooms, the electrical substation, and high and medium voltage transformers. The protected area at the plant totaled 294,000 ft3 distributed in 33 zones, including personnel control booths. The installed systems protect equipment valued at USD 60 million. With the installation of Victaulic Vortex 1500, Gerdau Corsa guarantees operational continuity, since, in the case of activation, the recovery of the protected area would only require between one and two hours of down time, while the complete reactivation of the fire suppression system takes only four hours, including the time needed to refill the nitrogen and water tanks.